It was a victory that had been 18 years in the making. 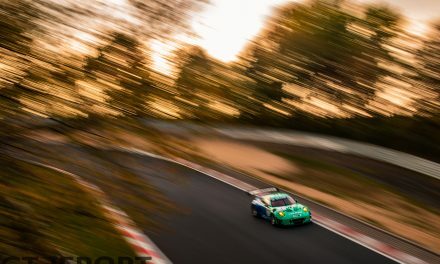 For almost two decades the Falken Motorsports crew tried and tried again to claim the win in VLN. Coming so close so often, running with the top dogs but always ending up playing support to the eventual winner. 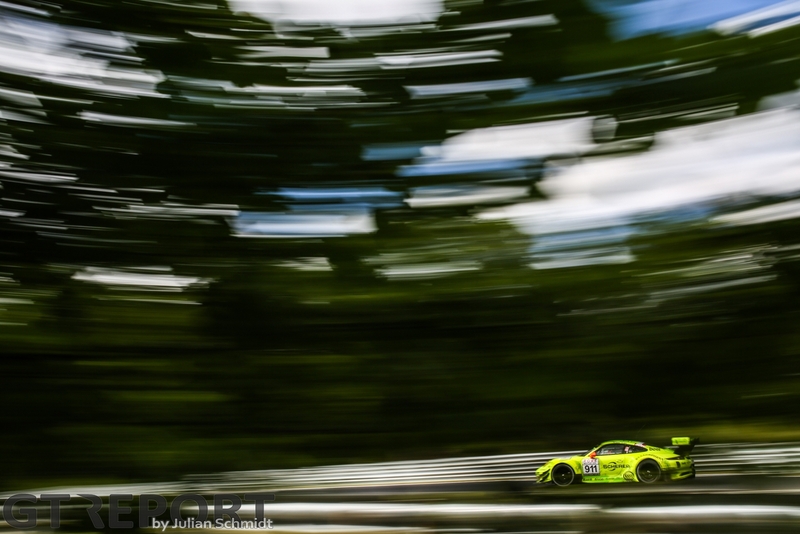 Seasons in the Eifel came and went and the Nissan Skyline cult car made way for the thoroughbred Porsche 991 GT3R. None of those teal and blue machines ever took the gold. 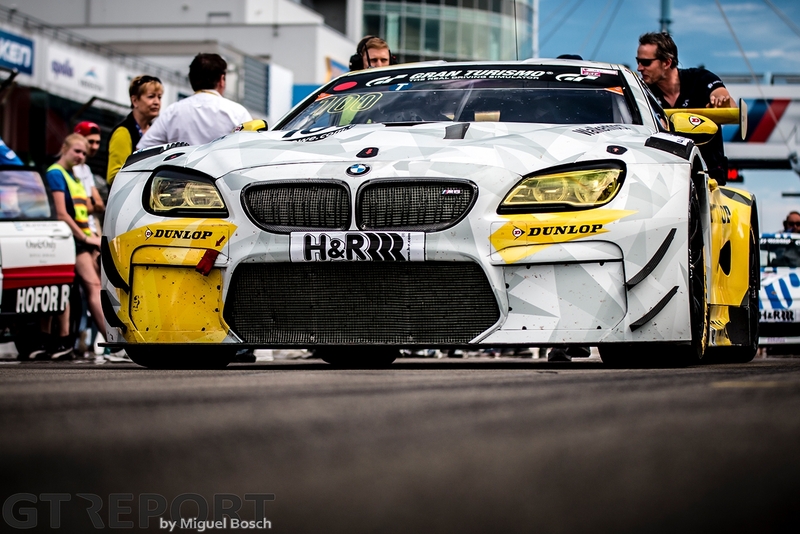 It had to be Jörg Müller and Stef Dusseldorp in the made-for-war BMW M6 GT3 to bring home the team’s premier Nordschleife victory at the 48. Adenauer ADAC Rundstrecken-Trophy. 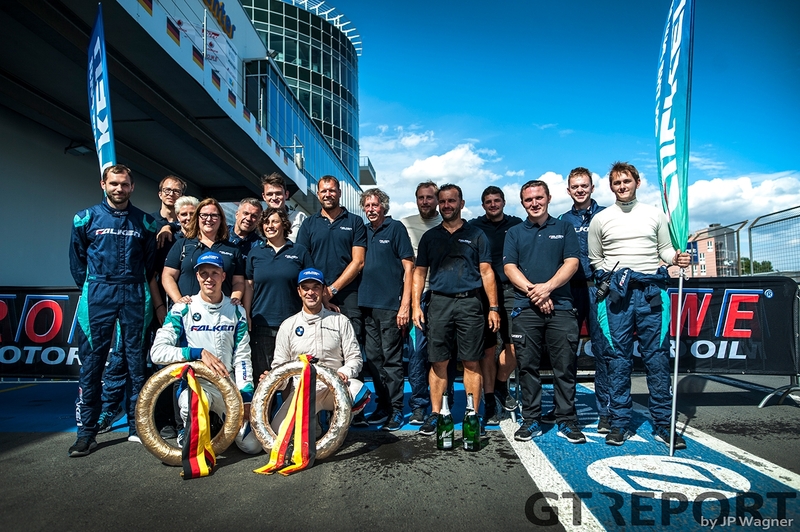 The seeming ease with which the Team Schnabl Engineering-run Falken Porsche took the spoils came as an upset in a weekend when all eyes were on the number 911 Manthey Racing Porsche 991 GT3R and Dunlop Walkenhorst Motorsport M6 GT3. Expected to decide the race between them, the two teams were relegated to go to head for second place. 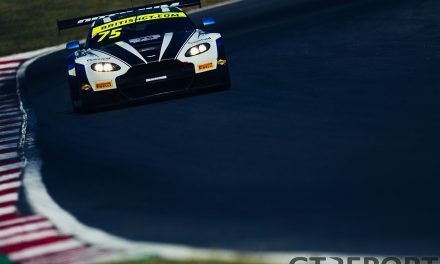 Qualifying sees the return of current lap record holder Christian Krognes going around the endless Nordschleife in anger. 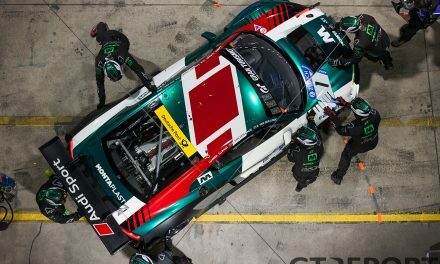 Back in action after missing both the 24 Hours of the Nürburgring and the third VLN race, the Walkenhorst pilot comes out swinging but misses pole position by just eight tenths of a second. 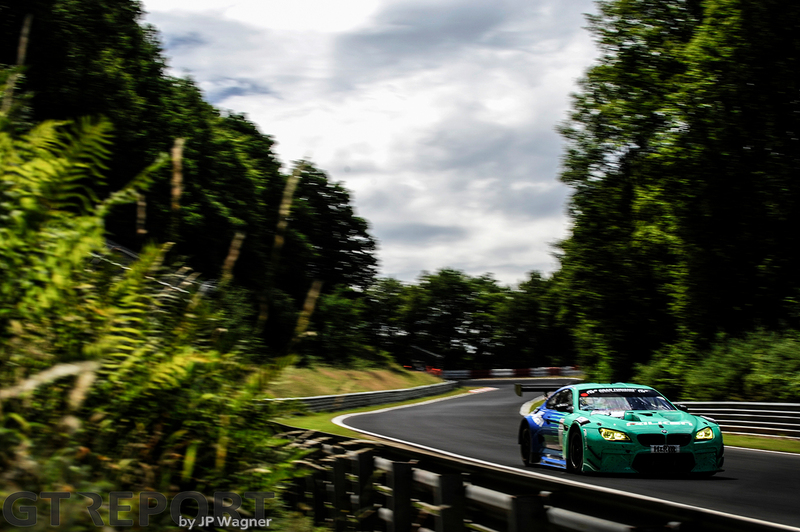 Even a place on the front-row isn’t in the cards for the Dunlop-sponsored Walkenhorst Motorsport BMW M6 GT3 as those two places on the grid are occupied by the Falken Motorsports BMW M6 GT3 and—back on pole like two weeks ago—the number 59 Manthey Racing Porsche 991 GT3R. 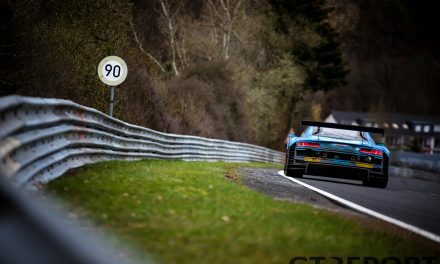 In a revival of VLN3, Sven Müller takes control of the start, shooting off onto the Nordschleife with Jörg Müller and Krognes in his wake. Very long the Porsche’s success won’t last. At the short, twisty climb up to the Karussell, Jörg Müller squeezes the big BMW alongside the nimble Porsche and seizes the lead. 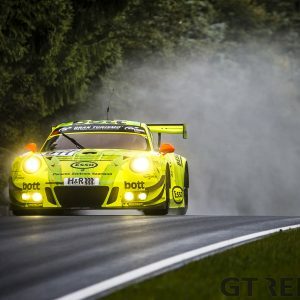 It’s the beginning of the end for the Pro-Am Manthey Porsche. A powertrain issue is starting to develop and before long Sven Müller steers it into the pits for inspection and retirement. The Krauth-sponsored Porsche isn’t the only top contender today to have his dreams shattered. At the start of the third lap, Krognes unintentionally takes out two of his competitors at the entrance to the Nordschleife as he goes for the safe approach into a crash site. Braking for a possible yellow flag when cars in front of him collide, the unaware Klaus Bachler plunges his Falken Motorsport Porsche 991 GT3R into the back of Krognes’ BMW before being rear-ended by Oliver Kainz in the Wochenspiegel Team Monschau Ferrari 488 GT3. Although the Porsche eventually continues after a long repair, the Rinaldi Racing-run Ferrari is retired on the spot while Krognes continues without delay. In the busy traffic, Jörg Müller works his way through the opening stint. Slowly, he’s moving away from his pursuers. Krognes needs to make a move just to stay in the game, but with the rapidly degrading tyres has his hands full keeping the back of the car in line. 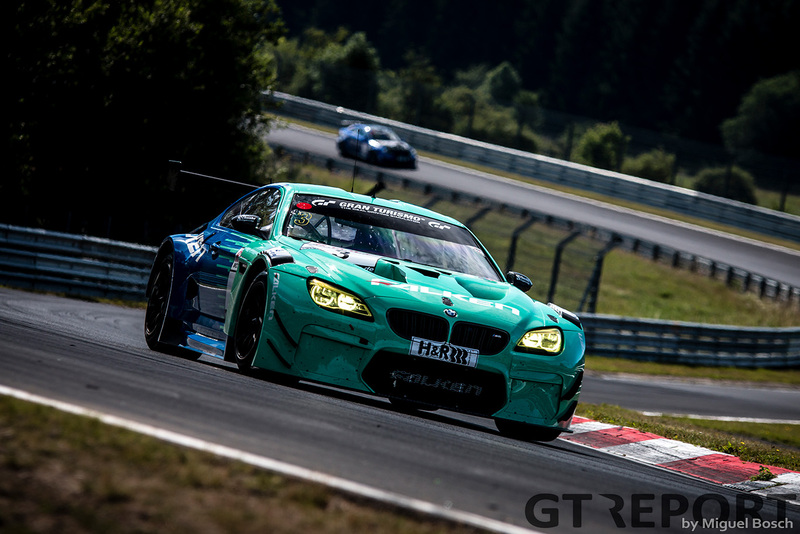 As he loses places, the gap to the Falken BMW grows to 30 seconds at the end of his five laps in the car. Stints pass by on this particularly humid Saturday afternoon in the Eifel. Stef Dusseldorp is continuing the race for Falken, picking up the pace once more and slicing and dicing through the pockets of slower cars as he goes for every inch. Matias Henkola, back in second with the Walkenhorst BMW, sees the Dutchman go and thinks the better of it. 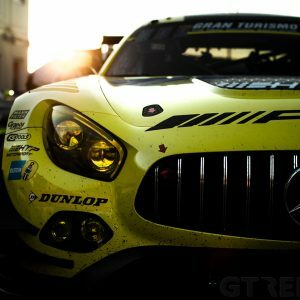 The Finn is sticking to his game plan of ensuring the tyres hold out the whole stint and keeping the third-placed Manthey Racing Porsche 991 GT3R at bay. There really isn’t much the others can do against the might of Falken. Dusseldorp and Müller are gone and surging towards victory. The best anyone else is going to do is second place. That’s exactly what Walkenhorst has now set their sights on. After Henkola, it’s up to Michele Di Martino. The young German loses second to Richard Lietz in the Manthey Porsche during the penultimate drivers change. A shorter second stint has given Manthey the upper hand as they can deal with a shorter minimum pitstop time. In the stint that follows, Di Martino races to close the gap to the Porsche. The car is doing a lot better than when Krognes first steered it to the green and in no-time Di Martino reaches the back of the green-yellow Porsche. For a moment, it looks like he can attack, but hindered in traffic Di Martino falls back. Di Martino remains unsuccessful in his bid for second, so instead Krognes is send in for the kill. While the 2012 VLN champion is waiting for his car to arrive in the pits, Dumas surges past Krognes for his Porsche to come in. The Frenchman doesn’t know who the man in the Dunlop-coloured overall is, but he’ll soon find out. Some luck, but mostly sheer speed, brings Krognes within striking distance of Dumas with half an hour left on the clock. In the all-out brawl for second, Krognes shows no veneration for the accomplished pilot, even going as far as trying to gently shove the Porsche out of his way. 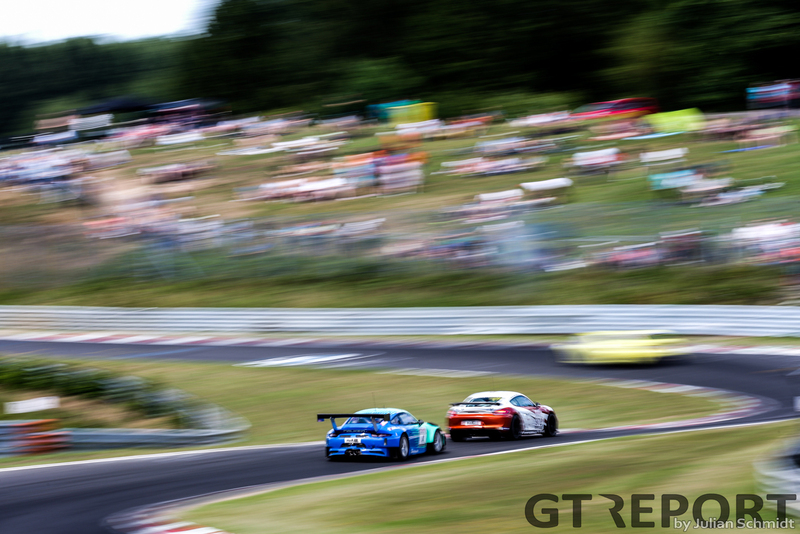 Charging to pass ‘Grello’ at every chance he gets, Krognes just can’t find a way past the heavily defending Porsche. His push is to no avail. Even after the half-hour dogfight, Dumas bends but won’t break. Krognes follows over the finish line by a fraction of a second. He loses the battle but wins the recognition and respect of one of the world’s finest GT racers, taking the congratulations on a good fight from his duelist. Manthey and Walkenhorst were left fighting for scraps. They went at it as if it was for the win, but weren’t. Falken lets it all happen. 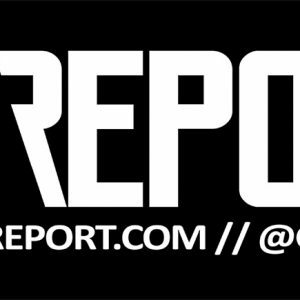 They don’t have to get involved in that fight, their unabated early pace and perfect execution gives them the room to breathe in the last two hours, leaving the rest of the field behind. The all-pro Frikadelli Racing Porsche 991 GT3R might have had some fooled by stretching their fuel mileage until the waning moments of the race, but the Falken squad knows the race is theirs long before then-leader Norbert Siedler comes in for a quick splash and dash. Dusseldorp crosses the finish line for the final time as the Butzbacher crew embraces the moment and each other. Silver and bronze was all they had up to now–today they make it to gold. And with that the long wait is over.